Hi! It's Tuesday which means new digikits from Hero Arts. They've released four today - four holiday kits - and all are FAB! There's Christmas Critters, Holiday Houses, Snowy Night and - the one I am playing with today - Winter Forest. I love love LOVE this reindeer, and guess what... it's one of the stamps in the Winter Forest digikit (which, by the way, is only $2!!). I printed it onto some Elle's Studio digital patterned paper, trimmed and added a little baker's twine scarf and a red nose using a Hero Arts metal accent. I love it when a stamp that is quite small in real life can be made a huge focal point of a card when used as a digi stamp. 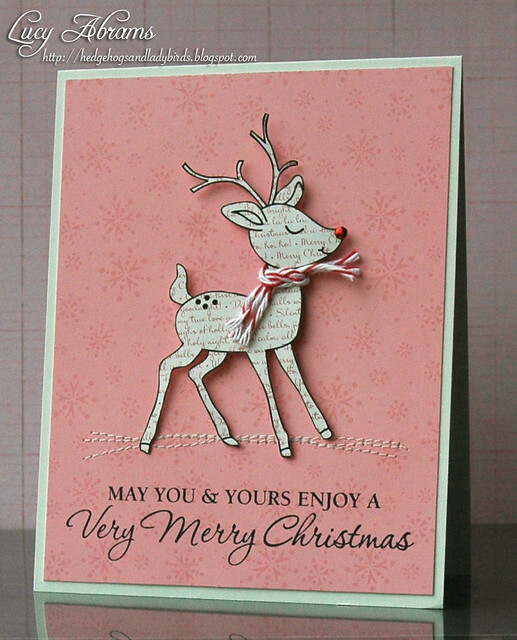 The background was made by altering the lovely snowflake background stamp from the new Holiday Houses digikit to pink, then printing onto Carnation Layering Paper. Then I added a stamped sentiment from Very Merry Christmas. I've got lots more to share with you this week using these awesome kits. Hope to see you tomorrow. Such a beautiful card Lucy I love this little character. That deer is as sweet as can be, I adore her!! Just darling, Lucy! Love his scarf and red nose! This is adoooorable! I'm a total sucker for that deer stamp!